I was recently on Twitter, lamenting the fact that I did not own China Glaze Party Hearty (the glitter bomb from Holiday 2010), when @squarednails said "Hey, you dope, it's still available on Victoria's Nail Supply". No, I'm kidding, she didn't call me a dope. By the way, many thanks to @moresynthplease who kindly offered to check her local beauty supply store for Party Hearty (this is why I love the Twitter community!). So I ended up ordering Party Hearty from Victoria's Nail Supply, but I mean really, it's so wasteful to order just one polish right? The shipping costs and all that... you really should order several polishes, yes? 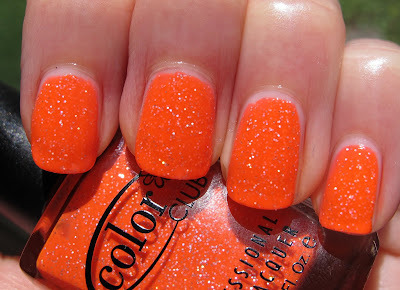 Which brings me to the polish I'll wear ALL summer, Color Club You Got Soul-ar! This, along with two other Color Clubs and an OPI glitter, fell into my shopping cart and I'm so glad it did! 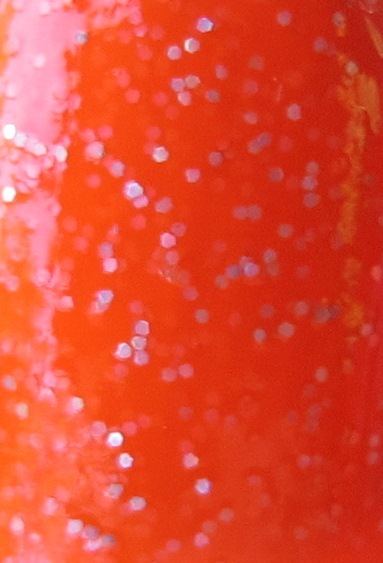 You Got Soul-ar is a crazy bright neon orange, with a bit of pink to it, and silver holo-y glitter! This was making my camera go crazy, the color is not quite right. Like I said, this orange definitely leans a little pink, not like traffic cone orange. It's much more flattering than traffic cone orange. I think it'll flatter many skintones! Edited to add: this is three coats in all pictures. 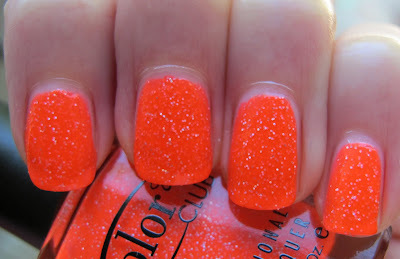 Neon + Glitter= DUH, I LOVE IT!!!!!!! I wear neon polishes on my toes and/or nails basically all summer and you know I love glitter, so the Color Club Starry Temptress collection is an obvious love affair. I think I need to order the rest of the collection now that I've seen the wonder. Like all neons, these dry kind of matte, so use a top coat if you want shine. However, they look neat matte too! The formula was lovely on these, kind of thin and easily controlled. Plus, they dried very quickly!! I'm a little bit obsessing over these, and I think they look even better in person than on camera. Cameras never quite capture the brightness of neons. I'll have posts about Otherworldy and Ultra-Astral soon, and will probably complete my collection very shortly as well! The Color Club Starry Temptress Collection is available online at Victoria's Nail Supply. KarenD- is the purple one gorgeous? I think I need it! NikkiCottonTail- You can still get it! I was so excited to find it still for sale!! What a gorgeous orange! I love neon and glitter!